If you live in Portland, like coffee and read Willamette Week, chances are you read WW’s “Drip City” feature on Portland’s coffee scene earlier this month, which highlighted the revival in simple, pour-over coffee (oddly labeled as “nerd coffee”) and the cafes that serve them. Ironically, the same day I picked up a copy of WW, the electronic newsletter from Mr. Green Beans hit my inbox. While Willamette Week focused on some of the hot coffee hipsters making a name for themselves in the art of pour-over coffee, such as Water Avenue and Coava, Mr. Green Beans was announcing the launch of their Mississippi Coffee Company, which takes the pour-over concept to a completely different level — the pour-over coffee cart. Location: Mr. Green Beans, best known for selling Do-It-Yourself (DIY) supplies for roasting coffee, fermenting yogurt and making cheese, delivers an almost-DIY experience with their new coffee cart, just inside their storefront at out at 3932 N. Mississippi Ave. The Mississippi Coffee Co. is open daily 7am-7pm. Coffee: We visited the coffee cart on a rare sunny and warm weekend day this April (yes, there was at least one of those days this month), and had a leisurely and tasty experience. First, our coffeemaker asked us which coffee apparatus we preferred for brewing our drink — the Hario V6 or Chemex for coffee that is brewed by pouring hot water directly over a filter and into a pot or cup; or the Aeropress for an “Americano”-style drink. We chose the Chemex and then got to choose the filter — stainless steel or the stiff paper kind from Chemex. 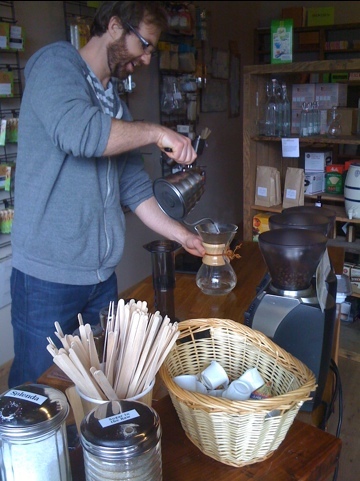 Lastly, we had our choice of roasted beans, which were micro-roasted in the shop earlier by Mr. Green Beans himself. 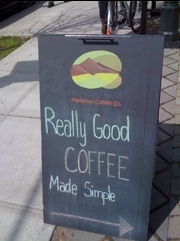 Mississippi Coffee Company also offers other small, independent roasts like one of my favorites, Trailhead Coffee. 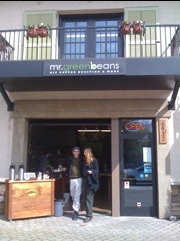 But this time around, we got the home-roasted Mr. Green Beans beans, and after a few minutes of brewing, got to enjoy our coffees and chat with the staff. Cool stuff: Great Do-It-Yourself vibe — even if you’re not the one pouring the water, customers make individual choices that ultimately result in a cup of coffee made to order. While you wait, you can check out Mr. Green Beans’ coffee-roasting supplies and other DIY gear or inquire about classes. While we had our coffee the pour-over way, Mississippi Coffee Co. has also launched an “honor bar,” a small counter next to the cart with two pots of freshly brewed micro roasts and plenty of cream and sugar. If you bring your own cup, the coffee is just $1. Not so cool: Up until now, the fake-Italian-looking building and piazza that Mr. Green Beans occupy has looked a little out of place and a bit lonely on Mississippi. But the bustling coffee cart promises to jazz up the sleepy little block, along with a new yogurt shop next door. I’m not sure where I can post this, it isn’t attached to your latest blog, but didn’t see a contact email anywhere else. I saw your post about The Blind Cafe from last year and wanted to let you know that if you’re interested in attending, it’s coming back in June (the 2nd-4th). We’d love to have you there and hope you’ll help The Blind Cafe spread the word about our return to Portland! Hey, this is great. I would be happy to post info on the next event in Portland. Thanks for the message! I am excited to check out your blog as well.